Makes total sense. Great example. I actually did a version of that exercise when I got a DC job. I was just saying that BB's level of detail that is implied in the article is much more than I think is required in our game. What this Dinosaur does now is I draw up the plays for myself off of Hudl. I'm a visual learner. But I no longer draw these up on the computer (old Appleworks program was great, Powerpoint not so much) and send them out to the coaches. Hudl clip #7 RHHS-WLHS. observe how the defense is aligned to the Red formation and how the MLB reacts. This puts the onus of looking on the coach who I am sending it to. It also saves me several hours of grunt work on Sunday afternoons. One of the things I can get from a Hudl analysis, that you can't always see live or from watching film is offensive patterns: i.e. certain plays are followed by other certain plays. The bottom line, unlike the Pros, is that you can end up with too much information, the proverbial paralysis by over analysis. I thought it interesting, and I wrote about it in the other thread, is that the Patriots issue film demerits for missing assignments that should have been seen in film study. The point of padding isn't to prep the opponent, it is to prep the coach. When you thoroughly break down film like this you start to notice subtle tendencies that carry over when it's time to game prep. You start to understand what it means when the guard and tackle are a foot closer to each other, why an OLB is 4x4 and the Corner 8x1 one play and up at the LOS and pressed respectively the next, why receivers vary their stance and splits, etc. It really is Football 101. Not only that, but in the NFL you play against the same coordinators and players for so many years that you start to pick up on their particular whens and whys. One thing that I'll add to this. I'm not sure how much football I really know, but I feel like my knowledge is pretty good. Regardless, the knowledge I do have I believe is strongly due to the fact that I have coached at various points of my career in the Pro Style I, Wishbone, Wing-T, Spread Wing-T, Flexbone Triple, and Spread Zone w/ various passing concepts borrowed from West Coast, Air Raid, and Run and Shoot. On the defensive side of the ball, I have been on teams that have run a 5-2, 4-4, 3-3 stack, 4-3, and 3-4. We have run every possible zone coverage and man. All throughout I have read the books, watched the videos, listened to the speakers, and learned as much as I could from the coaches I worked under. I've also listened to many coaches speak on offenses and defenses that we've never run. My point is, if you are a young coach, get as much information as you can on EVERYTHING (and if you're a HC encourage your coaches to do this). Don't pigeon hole yourself to only learning your team's offense and defense or even the position you coach. You are losing out on so much valuable information that definitely will help you down the road. For example, when we see "exotic" things like Flexbone Triple or Wing-T I don't bat an eye because I can pick up quickly what schemes they are running and what they are trying to accomplish because I've been there, done that. Hell, many times I can even decipher pretty quickly WHO they got their offense from. he isn't putting coaching vets in that position. He is fresh out of, accomplished young people in that position. Its not about what you know. Its not something that is going to be used or that BB and his staff won't find. This is are you willing to grind with necessary effort level. Drawing 100 plays and marking it up with details says a lot. Than being willing to not do 1 but 5-7 of them. Get rid of a lot of guys quickly who want to drink beer, wear the t shirts, and tell war storiestype coaches. That padding games for BB is about in my opinion. Like I said, I get that. And if you choose to run off high school coaches with that strategy, then by all means do it. But yes, I know why he does it. I read this article and started padding a game the way many described. I can't believe how much I'm learning about a game that I already though I knew a lot about. I'll definitely be encouraging my assistants to do this as an exercise to help them develop. The point of padding isn't to prep the opponent, it is to prep the coach. What took me two posts and 1000 words to try and say (not very well), is summed up in the sentence above. Studies point to people better learning things that they hand write than they type....maybe that has something to do with it? I read an article last off-season... "padding" games is actually part of Belichick's 3-day interview process, and might even be Day 1. He puts the guy in a room at 8 am with 1 game film and paper, says "i'll come back tonight." I've done a similar type of breakdown one off-season when I was new to coaching. While I learned some good info, the team the next season ran stuff completely different. High school teams change so often I dont know if this would be a particularly effective scouting method. Playbooks aren't as complex, personnel isn't as consistent, coaches aren't as demanding, and the kids simply aren't THAT good. Finding ways to get your best kid the ball while preventing their kid from getting the ball is probably more important than understanding their OL or WR splits. I know my kids are WAAYYYY to dumb to pick up on that. It might be better just to do on your own team. again, I don't think its to teach a system, or even how much you know, scouting or any other purpose. Its just a weeding out process. I would like to know how many have walked out. I believe his candidate-turnover rate was pretty high. Specifically to the Pats, the guys doing the padding were pretty much stuck in their role until they could find and train a guy to slide in under him. Matt Patricia and Josh McDaniels both worked their way up, but it was more by getting more and more coaches underneath them, and as coaches left, they were able to slide up a rung in the ladder. The Pats "job ladder" is really bottom-heavy, which is probably part of the reason Belichick has such a wide-spread coaching tree. All of the guys who've made it high enough to be wanted have all been very heavily vetted. Both of them also started at the bottom, brought in by guys who were already in the system. Serious question- what do you do after you have padded a game is there someway you organize the plays in order to look for tendencies? Or is it more of an exercise to fully understand what a team is doing? Thats a good point that is being implied, or at least think is being implied, and that is padding alone does not give you an overarching tendency breakdown. It gives you a different perspective into what and why an opponent does, and it forces you to look at a lot of nuanced details that may otherwise be missed. But if all you did was pad then there is a chance you could miss out on tendencies (and this is where HUDL or other spreadsheet type breakdowns are beneficial). There is a saying about 'seeing the forest for the trees', well spreadsheet type breakdowns allow you to see the 'trees for the forest'; in essence we may think we see something while padding that the numbers disagree with (the least reliable witness is an eye witness). For example, I was the new guy to a staff of older veteran coaches, there idea of breaking down film was to watch it, comment, and discuss what they saw- who they should double team, run away from, etc. After watching the film and talking for a while they had a plan. Not writing that it was as in depth as padding but the point will still be viable. Well I always did all the tendency breakdown on my own afterwards and showed them how often what they thought they were seeing was off. For example we faced this one team who was roughly 70% inside the tackles when in single back, but the plays that stood out most to them were crack toss, so they all were talking about how to stop crack toss. They go on for a while til I get tendencies done and then point out to them that we need to be more worried about inside run; they don't want to hear it until I show them the numbers. There is a point to what HUDL does, and a different point to padding. If you pad it, draw everything up, put in every conceivable known piece of knowledge on their? Purely educational, and almost impossible not to see things you otherwise wouldn't see. I think it is possible though that you would see so much you would miss out on the bigger picture, you could be overwhelmed by the amount of work you have done. Thats why tendency reports are beneficial. Actually, I think that a lot of times it works the other way. I think that sometimes we get so involved in the process of breaking down the film that we miss a lot. I agree both can happen, thats why both tools are useful. Again, I don't think the super in depth practice that people are referring to here as "padding" as referenced in the article is being used as a game week prep tool. Through analytics, the Patriots figure out that when the are in the redzone and it is 2nd and 10, they are most successful in 12 personnel. Through Hudl and scouting, the Patriots figure out in the redzone that on 2nd and 10 when a team gets in 12 personnel that Cinncinatti is going to run the Bengal or Tiger blitz. Through padding, they realize they can identify which blitz it will be based on whether the SS is head up the TE at 10 or whether the SS is inside the TE at 8. Bam, Patriots get in the redzone and throw an incomplete. It is 2nd and 10 and they go 12 personnel. Tom Brady checks to the appropriate play based on where the SS is and the line knows where the blitz is now coming from. I used to work for a coach who did something like this- he was the HC, and only taught 2 classes so he had lots of time, but he drew it up like you wrote. Serious question-- how else would one do it and feel they did it "properly"? I have never done this to the extent & detailed as described above. However, one thing I have always done that I believe has helped me immensely and I always encourage my coaches to do as well is draw up all of our plays v. various defenses continuously and regularly. I do this quite often and more so in the off season. it keeps me sharp. I find it a better exercise at times then even watching film b/c it's more "hands on". I like to draw up opponents defenses and then I try imagine adjustments they would make that would be difficult for us & then draw adjustments I would make. It's kind of a chess match I have w/ myself & in some ways has become almost a hobby when I have down time. Some people like crossword puzzles I like diagramming pays. I also think it helps you to "see ahead" & readies you to make adjustments going into a game. Maybe I am misunderstanding you, but I don't think I need to weekly draw up I-Slot Power vs Over C4, with all my players reactions for the scout O playcard every week. One, I have already drawn up that offense, and a lot of other offenses, against all of our defense; when I first was creating my defensive playbook I sat down and drew everything up against most everything I could think of, refined, tweaked, and did it again. Over and over until I got things how I wanted them. So however we played it in week 1 is how we will probably play it in week 8 (no need to draw it again it works the same). Two, I tend not to put defensive actions on offensive scout cards, it gets confusing. I tried the Hudl breakdown 1 time. Didn't like it. Done them on paper before and every since. We meet as a defensive staff every Saturday to breakdown the games. 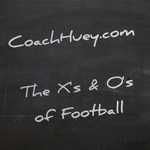 Down and Distance, hash, yard line, formation, any motion, note different personal, play, ball carrier and result. (I have a old scout form I made.) We do that for all games we deem important, for district and playoff's we do all games. I have a couple of guys I trust do some advance scouting before if we have a ton to breakdown. After that we will then do Tendencies, hit sheets, formations etc. Then we will begin to watch the films for tells and tips. Then we will try to get the best calls for each situation and decide if we have any automatics. Can't stop everything. Just stop the best plays. This to me is by far my favorite part of Coaching. When I first took my current job it didn't take me long to figure out who was wanting to really "coach"! Everything I input into HUDL I download into EXCEL. I like what I can do in EXCEL because I have been using it for years and can manipulate data the way I want. Another reason I like EXCEL is that I can enter some info and EXCEL formulas will get me more info; in other words, EXCEL will do some of the grunt work.